A senior Tesco manager who tweeted that shutting five depots was an example of “awsome teamwork” and #worldclass has come under fire in Westminster. 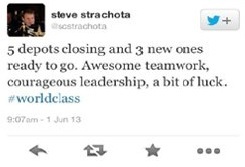 Distribution Director Steve Strachota sent the tweet about the re-structuring of Tesco distribution centres which will see thousands of posts transferred with some quite possibly at risk of redundancy. The depots facing closure are in Harlow, which has 800 staff, Barlborough, near Chesterfield, with 400 employees and Weybridge, which has 650 staff. Strachota has not been available to comment on his tweet personally, however. The MP for Harlow has tabled an Early Day Motion calling for the House of Commons to voice disappointment at Tesco’s “treatment” of the affected staff. It is not unusual for employees to speak out on Twitter or other social media sites, to communicate with friends, the online community at large or engage with other employees. It is more unusual, howver, for senior employees to be so outspoken, particularly on sensitive topics such as changes in the workforce and in such a thoughtless manner. It maybe unusual for an employer to apologise for the comments made by its employees if speaking in a personal capacity. By doing so, there is an argument that Tesco has assumed some responsibility, which could open it up to a claim of vicarious liability. Disclaimers on social media profiles will go some way to distance an organisation from its employees, but they are less likely to have the desired effect when an individual is recognised as, or holding themselves out as a representative or spokesperson. To reduce any risk of liability, employers should make all employees aware of any social media policy it has in place and ensure that they are followed. Monitoring social media output is one way to reduce risk but, as with most things, prevention is better than cure. Tags: Chesterfield, Employment, Expert, Facebook, Halfon, Harlow, Law, Lawyer, Media, MP, Parliament, Policy, Redundancy, Social, Tesco, Twitter, Weybridge. Bookmark the permalink. Previous post ← Could Atticus Finch save the justice system?